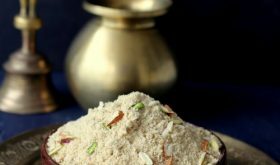 Panjiri is a traditional Indian whole wheat flour or atta based sweet prepared in the Northern states of India especially Punjab. It is considered a fasting food and a must make prasad for festivals like janmashtami or while performing satyanarayana pooja. It is very popular in Pakistan too and is called Hyderabadi panjeeri. This popular winter special punjabi panjiri (also called dabra) is made with pure desi ghee aka clarified butter and a treasured gem among Indian sweets or mithai. There are many variations to the basic panjiri recipe. Dry fruit panjiri, dhaniya panjiri, methi panjiri, panjeeri using only semolina are also popular among home cooks. Each home cook has his or her own style of making panjiri. 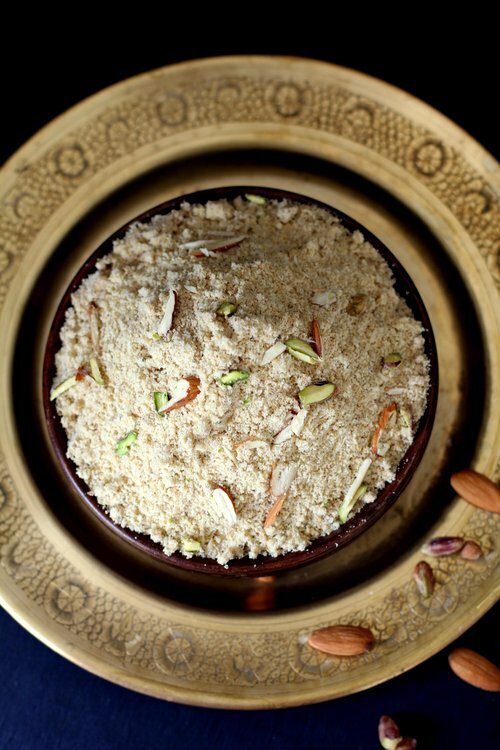 The panjiri ingrdients usually include whole wheat flour or aata, sugar, nuts like almonds, pistachios, green cardamom and desi ghee. 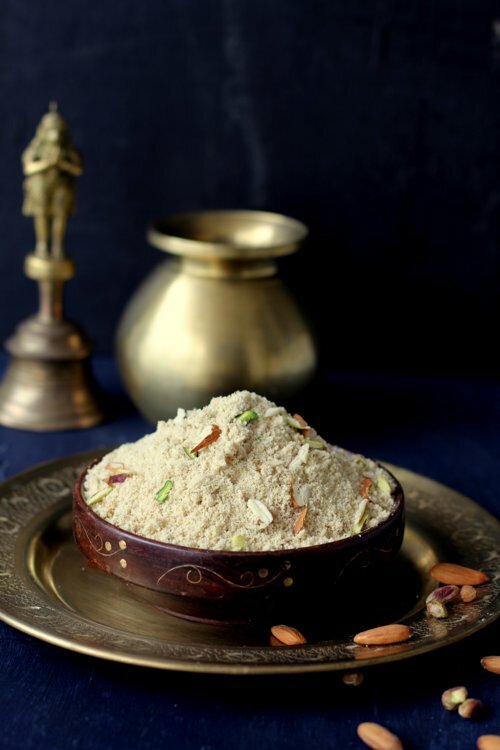 The authentic panjiri calls for a generous amount of ghee and the texture is almost like wet sand due to the use of a lot of ghee. I have reduced the amount of ghee so the picture of panjiri reflects a loose powdery texture. And I must mention that the whole home is filled with an irresistible aroma while roasting the whole wheat flour or atta in ghee. This nutritious dry fruit mix which is a Punjabi style panjiri for new mothers is served along with warm milk after delivery as it provides the necessary nutrients to help recoup and regain strength. Health benefits of panjiri after delivery are tremendous. This ayurvedic nutritional supplement has warming properties, aids digestion and increases lactation in lactating mothers after delivery. Panjeeri recipe for new mothers is laced with spices like dry ginger or saunth, fennel seeds, black pepper corns, poppy seeds, edible gum or gond and ajwain. Kids are served whole wheat panjiri with warm milk to nourish and warm their bodies during the winter months. If you want to serve this tasty sweet dry fruits laden mix to kids, do not add edible gum or gond and spices like black pepper corns and ginger powder as they increase body heat. Just flavor with fennel seeds and cardamom powder and serve it with warm milk to your kids. It makes for a great tasting healthy nutritional drink for kids. I made a jar full of panjeeri to see us through the winter months. Panjiri has a long shelf life of at least 45 days. You can refrigerate this nutrient rich mix for longer shelf life. Many home cooks add roasted and ground makhana or lotus seeds and magaz or melon seeds too. A Gujarati friend’s mother would add roasted makhana and dried coconut to the basic panjiri and must tell you that it was one of the best tasting panjiri I ever had. Heat 2 tbsps ghee in a heavy bottomed vessel. Add gond or edible gum and saute on medium flame till it puffs up and changes color. Remove with a slotted spoon and set aside in a plate. In the same ghee, add the almonds and pistachios and saute for 2-3 mts and remove with a slotted spoon and set aside in the bowl. Next add khus khus and saute for 4 mts on low medium flame. Next add the grated dried coconut and saute for 3 mts and remove the khus khus and coconut mixture and set aside in a separate bowl. In the same vessel, add a tbsp of ghee, add the semolina and saute for 8-10 mts on low medium flame or till light pink in color. Remove and set aside in a separate wide plate. In the same vessel, add 2 tbsps ghee, add the besan and saute for 8-10 mts on low medium flame or till a nice aroma emanates the kitchen. Remove from vessel and add to the plate in which semolina has been placed. In the same vessel, add the remaining ghee and add the whole wheat flour. Saute on low medium flame, mixing continuously so that it does not burn. It could take a good 18-20 mts. The flour will change color and give a nice aroma. Turn off flame and remove to the plate in which semolina and besan have been placed. Next, set aside 5-6 roasted almonds and 6-7 pistachios for garnishing and grind the remaining roasted nuts to a fine powder. Remove and add to the wide plate which has the roasted wheat flour, besan and semolina. Next, grind the roasted gond, khus khus and dried coconut to a coarse powder and add to the wide plate. 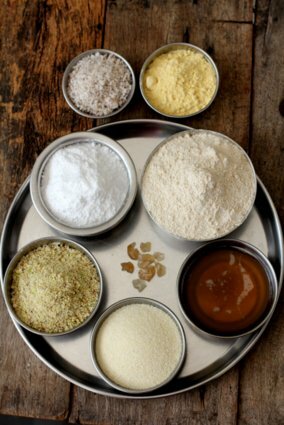 Next, add the ginger powder, saunf powder and cardamom powder to the rest of the ingredients and and mix well. Allow to come to room temperature. Add the powdered sugar and mix well so that all the panjiri ingredients are well combined. Cool and store in an airtight container. It has a shelf life of 45 days. At the time of serving, remove to a serving bowl and garnish with roasted almond and pistachio slivers. It can be eaten as a stand alone dish or served with warm milk. 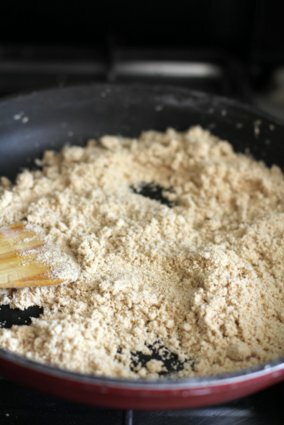 While sauteing the whole wheat flour, chickpea flour or besan and sooji, be careful that you keep mixing so that it does not burn. This is a very important step to a good tasting panjiri. You can add a heaped tbsp of melon seeds. Roast them along with khus khus and grind to a fine powder. You can also add 1/3 cup of makhana or puffed lotus seeds. Roast them in 2 tbsps ghee till golden color and grind with gond to a coarse powder. You can add roasted cashewnuts and raisins or khismish. If preparing for your children, omit gond, dried ginger powder and khus khus as these spices increase body heat. By Sailu Published: January 21, 2016 Panjiri recipe, a sweet made in hindi spoken states offered as prasad for janmashtami. 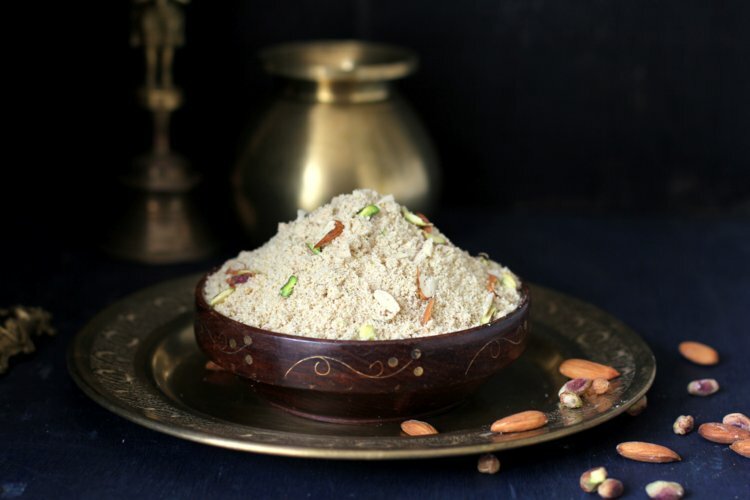 Panjeeri uses atta, dry fruits and has health benefits for new mothers after delivery.